Three Reasons to Choose Custom Connectors » HHP Associates, Inc. While standard options available may work, many times a custom solution is exactly what the Engineering community needs and turns to in any effort to solve a problem and bring the design project to completion. By nature, electrical connectors lend themselves to customization. Often one of the last components addressed in the design process, and after key elements have been solidified, a solution to the electrical connectivity equation begins to get attention. Electrical connectors need to adhere to strict specifications, but sometimes they need to provide connectivity in special, unique ways. This means the configuration of the connector size, contacts, mounting options and other application specific needs must conform to the design of the project and provide reliable operation. Positronic offers custom connector solutions for Electrical and Electronics Engineering (EEE) projects from aerospace, military, medical and beyond. 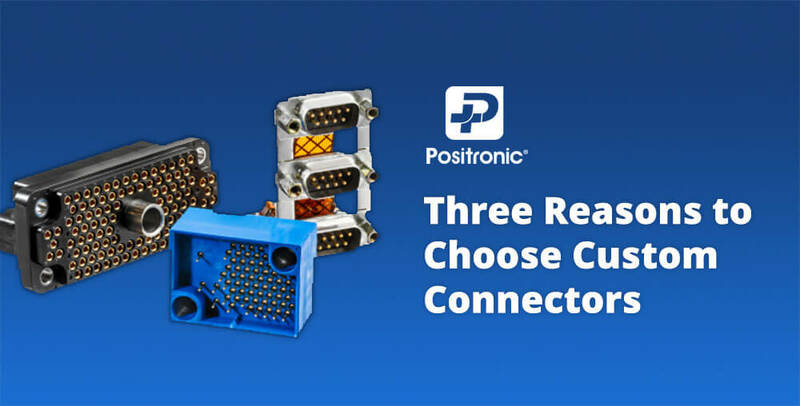 Positronic experts shared three reasons why a custom connector may be the right solution for engineering design challenges. Engineers are behind the scenes in every industry – solving problems and utilizing their creative ideas to develop new technologies that make our world a better place. Drones, for example, are being used more often in a variety of applications, including the inspection of wind turbines or electrical towers in remote places. These sophisticated drones require connectors that are small enough to fit the footprint yet keep the connection for power and signal secure. Another unique example is a small connector developed for the antilock braking system and stability control system for military vehicles. These connectors were part of a larger project to modify existing fleet vehicles to improve occupant safety. Each piece of the overall design, such as the custom connector, was an important part of the final project, and the design engineers were able to provide their end customer with a solution that met their precise requirements. There are hundreds of other examples when configuring the right connector can make all the difference for the end design, functionality, and experience for the end user. Engineers are eager to solve challenges that their customers bring, and these challenges are not always brand new. connector is defined as a simple modification to an existing product all the way to a clean-sheet design done for a unique end user application. Healthcare x-ray machines are one example where a custom connector is being developed for a specific need. The healthcare company required longer than usual contacts and a plastic shroud. The connector would be immersed in insulation oil, so it was imperative that the connector continued to reliably operate under these harsh conditions. Solar powered irrigation systems present another example where a custom connector was able to fulfill the desired need. The design required a connector to be submersible up to 200 meters and have a current rating of 20 amps. Because of the location where the connector was housed, a 3-pin connector was required with cable to cable connection. A high-speed lithium-ion battery powered wakeboard is designed to fly on the water at 58 kilometers per hour carrying an adult rider. In this example, a press-fit power connector passes 200 amps of continuous current in the harsh sea-water environment, providing the rider a seamless and an exciting experience. When a project calls for a custom solution, quality should not be compromised. In fact, it is of utmost importance. The connector needs to comply with industry standards, as well as meet the custom need. When looking to source a custom project, make sure the company is qualified and has experience building custom connectors. Also consider cost and lead time, because these affect the result. Generally, a vertically integrated connector manufacturer has the ability to produce all components internally therefore eliminating the dependency on third party restrictions and can deliver a sound solution from the first try. The final product will need to operate consistently, reliably and for a long time. Weigh all options before selecting a partner that will provide a trusted solution. Select a partner who conveys certainty! Keeping an open mind about using custom connectors in any industry, for any application, and working together with the connector company to design a solution that best fits the project, will result in a creative, cost-effective, and desirable experience for everyone.